There is an Academy Award winning documentary from the 80s called The Times of Harvey Milk. Fortunately for director Gus Van Sant, not many Americans moviegoers have seen that film, and so they won’t realize that the story of Milk has been told before, in almost the same fashion. Van Sant’s Milk is a drama starring an outstanding cast led by Sean Penn. 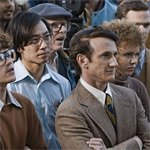 Penn plays Harvey Milk, a 40-year-old insurance agent living in New York. Gay men like Harvey are still being arrested in gay bars (as the opening montage shows), so he has to be careful whom he picks up in the subway. Luckily, on his birthday, he finds Scott Smith (James Franco) who is willing to travel across the country with him to start something new in San Francisco. Together they open a camera shop on Castro, in the heart of the gay community. But even here, homosexuals are treated as second-class citizens, and Harvey decides to run for office to try to change things. A good portion of the movie follows Harvey’s early attempts to break into politics. If you’ve seen the documentary, you already know that Milk was eventually successful; his claim to fame is that he was the first openly gay politician elected to public office in the United States. Penn gives a great performance. His resemblance to the real Harvey Milk is remarkable. There’s a brief shot of the real Harvey at the end, and although the men don’t actually look that similar, when you see them move and talk, Penn’s performance is uncanny. One scene is worth mentioning: there’s a moment of political victory near the film’s climax, and Penn screams out in unrestrained joy and jubilation. He leaps off the screen as surely as he did during his breakdown scene in Mystic River. As a drama, Milk is able to be more intimate than The Times of Harvey Milk. Van Sant can put us in the same room with Harvey when the documentary’s cameras weren’t rolling. He shows us more about Milk’s love life than Times could, particularly a rollercoaster affair with Jack Lira (Diego Luna) that by all rights should have sidetracked Harvey’s career. Milk also paints a closer portrait of Dan White (Josh Brolin), Milk’s friend and nemesis, than the documentary captured. Brolin, who played George W. Bush in W.again disappears into his complex and troubled role. Brolin surfaces questions about White’s own sexuality that were all but invisible in the documentary. But really, Milk doesn’t deviate very far from the story told in The Times of Harvey Milk. Both are very good movies, and there is a chance they’ll both be Oscar winners. But if you’ve seen one and are inclined to skip the other, you wouldn’t be missing anything new. What would have been new, and what I suggest for the next remake, is a story told from the other side. Yes, it’s gratifying that we can look back on the bigotry of the 1970s and agree culturally, that it really was bigotry and that it was wrong (proposition 8 notwithstanding). What I’ve never seen, and what I would like to see, is a movie about the tragedy of being on the wrong side of history. Milk includes footage of Anita Bryant trying to put anti-gay laws on the books all over the country. She thought she was protecting children from harm, but she was mistaken. Her work, to the extent it was successful, was not only failing to protect children, it was also harming innocent Americans. She never honestly checked if she was making America safer; she just assumed and believed that it was so. Whether my hypothetical protagonist is Bryant or some composite, we only need to establish that she genuinely wanted to make America a better place and honestly thought she was helping. At the moment she realizes that her hubris is the cause of her own magnificent downfall, she could pluck her eyes out a la Oedipus and teach a new generation not to play so fast and loose with other people’s rights.